Appleseed's, online at Appleseeds.com, is your online resource for classic women's clothes and accessories. Appleseed's carries tops, summer tees, sweaters, blouses, knit tops, jackets, blazers, suits, and skirts. In addition, you can buy sleepwear, cardigans, denim capris, and shoes at Appleseed's. There are purses, cuffs, necklaces, scarves, hats, belts, tights, and trouser socks on sale at Appleseed's as well. RetailSteal.com has the best Appleseed's coupon codes, Appleseed's discounts, Appleseed's coupons, and Appleseed's promo codes. Shipping and handling rates at Appleseed's depend on the pricing of your purchase and your shipping destination. Free shipping is offered for orders over $50. See website for full details. Some exclusions may apply. 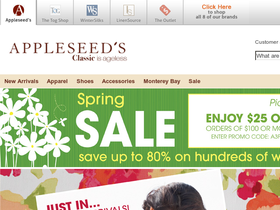 Shop at Appleseed's and enjoy 20% savings on your order with email sign up. Click here. Shop at Appleseed's and enjoy 25% savings on new arrivals. Click here for code. Shop at Appleseed's and enjoy $15 savings on orders $30+. Click here for code. Shop at Appleseed's and enjoy 15% savings on all orders over $49. Click here for code. Shop at Appleseed's and enjoy 15% savings on your order. Click here for code. Save up to 85% on items in the outlet at Appleseed's. Click link to save. Shop online at Avenue.com and enjoy these special Black Friday offers. Click link to shop and save. Shop at Avenue and enjoy $50 savings on orders $150+. Click here for code. Shop at Avenue and enjoy $25 savings on orders $75+. Click here for code. Shop at Avenue and enjoy 40% savings on 4 items. Click here for code. Shop at Avenue and enjoy 35% savings on 3 items. Click here for code.